The latest in a string of tragic suicides by gay youth, Zach Harrington ended his life after hearing anti-gay rhetoric at a City Council meeting. One man said he moved to Norman because he thought it was the kind of place that would never accept the GLBT community with open arms. A woman, who described herself as "bi-racial," said she was tired of the GLBT plight being compared to Civil Rights. Some of those who opposed the proclamation claimed that members of the GLBT community would use it to infiltrate the public school system, essentially allowing the "gay lifestyle" to become a part of the curriculum. Harrington's family thinks the meeting may have triggered his suicide. His sister Nikki says, "When he was sitting there, I'm sure he was internalizing everything and analyzing everything … that's the kind of person he was. I'm sure he took it personally." Harrington also apparently faced a homophobic environment growing up — his father says he "feared for his safety on many occasions" in high school, and his sister, who is older and went to the same school, says, "There was one gay guy in my high school at the time, and he was made fun of all the time. It was a pretty much non-stop thing at school." From what we know and can tell, there has not been an increase in suicide completions among lesbian, gay, bisexual transgender and questioning (LGBTQ) youth over the past few weeks. Sadly, there are likely this many deaths every week, but the media and the general populace are just starting to realize the depth of this public health and social justice issue. It's horrifying that so many young people have had to die for us to finally pay attention, and incredibly sad that we have to mark National Coming Out Day by mourning the death of another teenager. 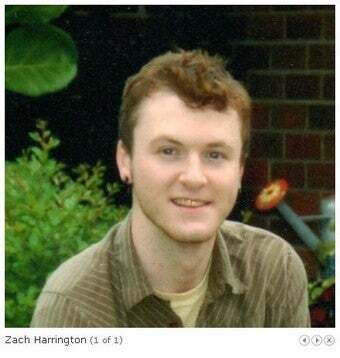 All the advocacy in the world won't bring Zach Harrington back, but we can honor his memory by making sure that LGBT suicides aren't just another story of the week, but an urgent call to support gay youth and fight against those who torment them.